Sakura Hostel Asakusa v Tokio, Japonsko: Zarezervujte nyní! **% of the first night's accommodation will be charged . Reconfirmation is necessary for this booking. Please contact us via email or phone call 1 week prior to your arrival to reconfirm your reservation. Tokyo Subway Tickets (1-Day, 2-DAY and 3-DAY) are now sold exclusively at SAKURA HOSTEL ASAKUSA (for our guests only). 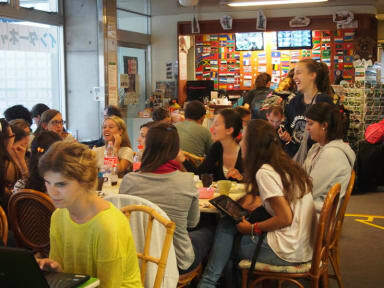 At our hostel, various fun activities are offered every week. FREE WIFI in the whole building including your bedroom. FREE INTERNET PCs in lobby available 24 hours. There are 6 desktop PCs in the lobby for the free Internet use. *Late night check in is no problem as our reception and door are open 24 hours. *We have a free storage for your luggage before check-in and after check-out. Only minutes away from Asakusa's main temples, shrines, pagoda, traditional shopping arcades, Akihabara Electronic/Animation Town, Ueno National Museum/Zoo & more. Asakusa has four train/subway stations for access all over Tokyo. Sakura Hostel Asakusa is a purpose-built 6-storied hostel with dorms and twin rooms, common kitchen, comfortable lounge and Internet cafe ideally designed for people to socialize and make friends from all over the world. The members involved in this hostel's opening, from the front staff to the architects, are all backpackers who have been wishing to have a cheap but clean and comfortable hostel which they would like to introduce to their backpacking friends visiting Tokyo.